'Tis The Season To Be Jolly :) and no worry fa la la la la! With holidays just around the corner, festive spirits (clearly :D) are on an all-time high this side of the world. From dinner decisions to smashing deck the halls-o-time, Cocktail nights in abundance ,rap stars to wrap-stars it certainly is time to warm up to the holiday season and to unleash the all-mighty-Christmas-avatars! 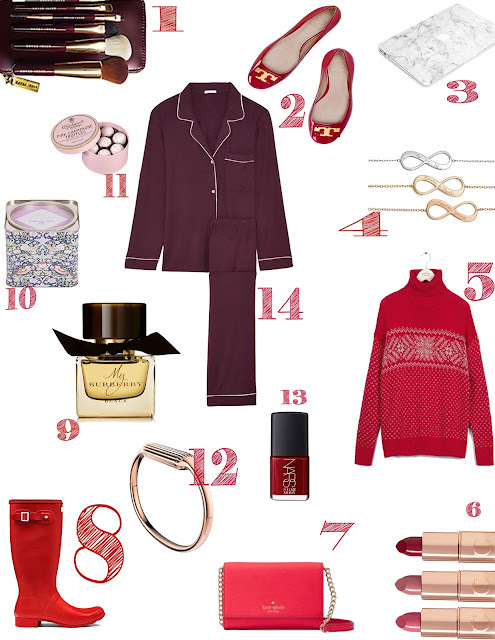 With insider tips and tricks into this season’s smoking hot-Gift Ideas, this post is all about Christmas-Empowerment! Beware, there will be joyful-teary eyed moments from Aunt Patty and Aunt Selma, and kisses galore from the younger ones- with our ultimate gift ideas-you are going on the CHRISTMAS WALL OF FAME! 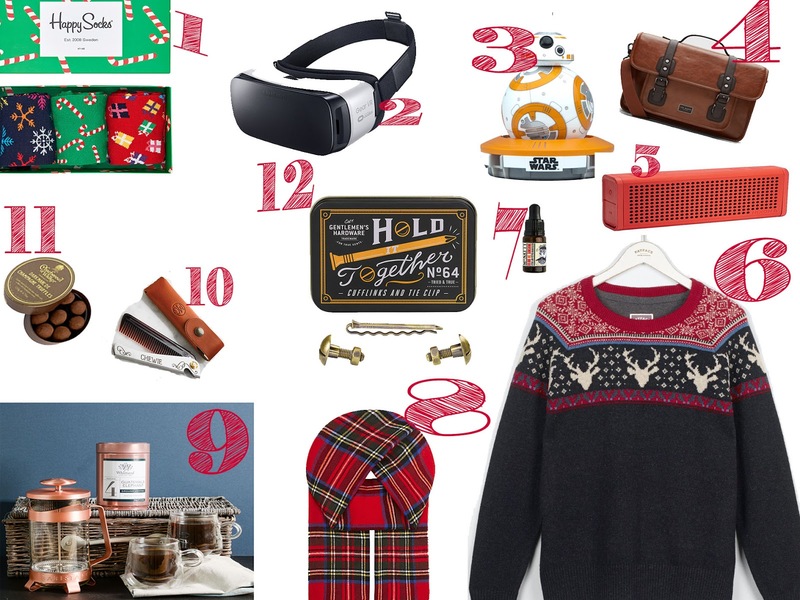 From hippity-happy socks –Oh baby its cold outside;) to a bit of gizmo, we’ve even thrown in some extra’s for the star wars fan in the house hold , read ahead for our Christmas favourites for the manly man! 1)Spur some razzle-dazzle to the mundane infinite -monotone sock collection this holiday season as its Always a happy day with happy socks ! 2)Well, a gizmo for the Monsiuer is the ultimate trump card! With Samsung VirtualReality Headset you will be etched in Christmas gift history! 3)Now,for the Han’s Solo, Jedi Lover in the house hold a BB8 droid is just the sort of gift that will elevate you to GLORY! 4)A stylish leather Ted Baker satchel is a keeper ! 5)For the music lover , the Nixon’s Blaster Portable Speaker might be just the perfect gift! 7)Some Moustache Elixir for POGONOPHILE! 8)The Royal Stewart tartan merino wool scarf , for the chilly wintry nights! 9)The WhittardCoffee Hamper for the coffee connoisseur! The Guatemala Elephant coffee surely hits all the right coffee notes! 11)Champagne Truffles- well Yes !!!! 12)Gentlemen’s Hardware Cufflinks and tie-pin set for some festive amusement! 1) Bobbi Brown Travel Brush set for the globe trotter! 2) Tory Burch GIGI pumps for the stylish friend! 3)Happy Plugs marble laptop case to style up her MAC! 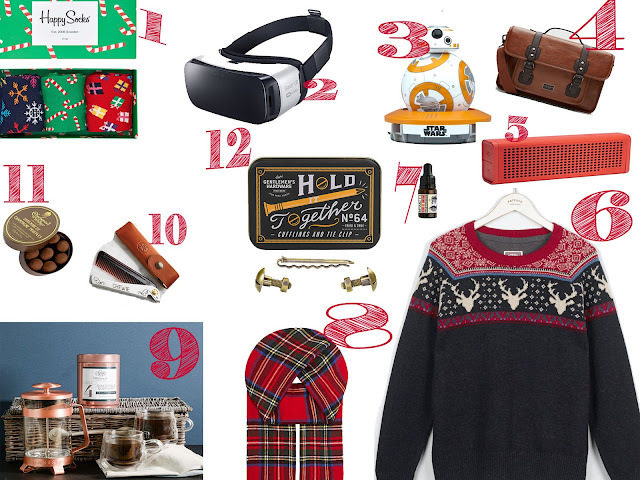 5)The FATFACE holiday jumper screams –cosy!! 6)CT mini’s for a tad bit of holiday pampering! 9) Burberry Beauty is for the perfume lover, with rich oriental floral notes it’s an amped up version of the ‘My Burberry Scent’ and an absolutely smashing product to be gifted away! 10)Posh LibertyTea to keep her happy! 13) Some Nars Sarah Moon limited edition is an absolute keeper and will be much appreciated by any make-up lover! 14) And Finally Some cozy Pj’s to wake up on Christmas day! 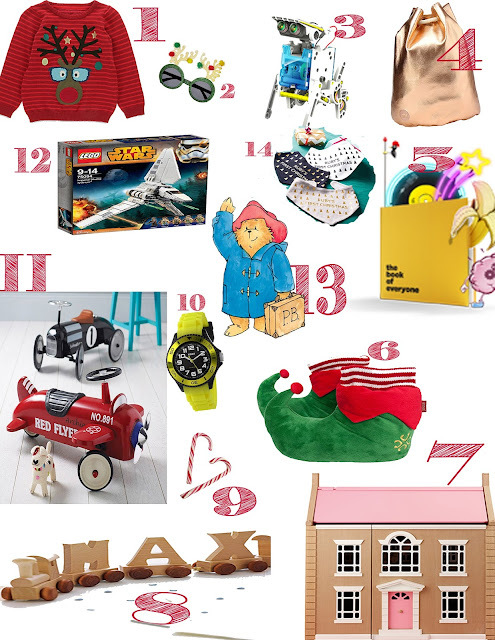 1)It’s all about Rudolf with the charming Jumper from M&S! Just the perfect cosy holiday knits! 2) A Christmas spectacle perhaps( ha!) The pompom novelty glasses screams fun! 3)A bit of robot –building- action for the inquisitive one! 4) A glamourous ruck sack for the glamourous diva!! 5) It’s all about YOUR story with ‘Book for Everyone’ , easily my favourite one from the lot! 6) Just the perfect foot wear for Santa’s helper! How cute are these Elf shoes from John Lewis! 8) Wooden Name train for the little one! 10)Uber Cool Nitro Watch for the sporty ones! 11)For some excellent whizzing around the house action –Retro Ride on Plane is promised to get the kids excited! 12)Star warsboard game for the tribe! 14)And finally a personalized First Christmas bib for the little one! Now that’s all the gift lists sorted!! Don’t forget to wind down and enjoy the season of festivities! We Would love to hear about your holiday favorites! !